Caregiving happens within a web of relationships of relatives, friends, professionals, and organizations. People are often simultaneously caring for themselves, caring for others, and being cared for by others. What each person does varies by ability and context, and over time. An Atlas CareMap is a drawing and a process for self-reflection and action, which also provides a catalyst for conversation. It is a diagram of a person’s care ecosystem, drawn by hand or computer, showing who cares for whom, and how. 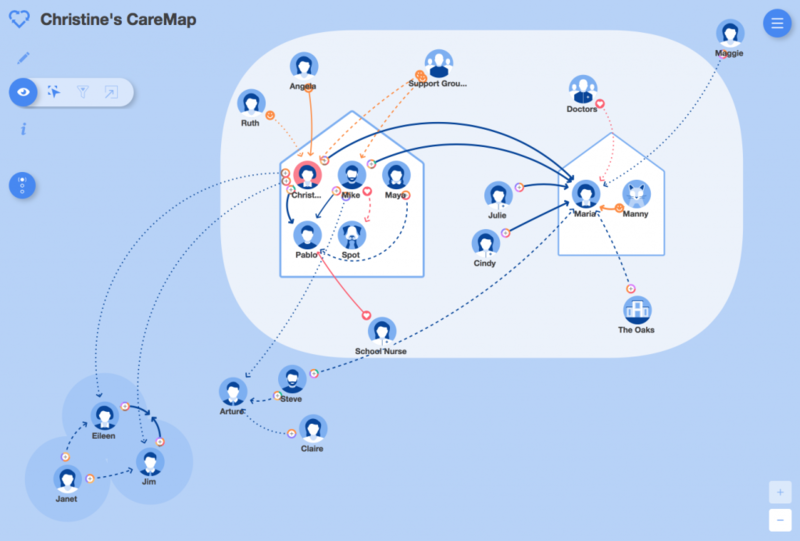 The process of thinking about and drawing an Atlas CareMap has helped people to more clearly see and to better understand their existing care ecosystem. For many, this has led to action and/or changes in perception resulting in stronger ecosystems, better care and more confidence in managing their care situation. Many have also found great value in sharing their maps with others, as they discover they have so much to gain, emotionally and practically, from sharing their respective care experiences and knowledge. 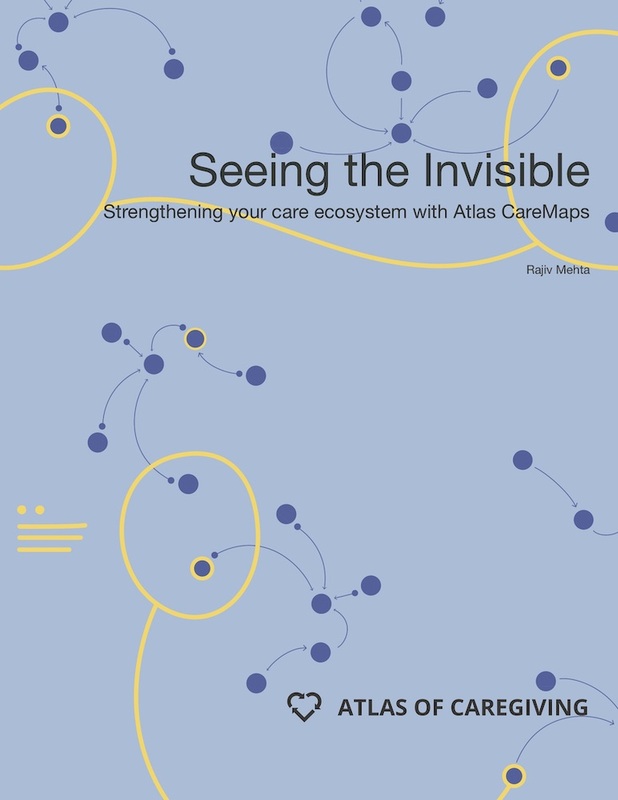 Download our booklet “Seeing the Invisible: Strengthening your care ecosystem with Atlas CareMaps” to learn to draw and use Atlas CareMaps. The booklet provides several examples, illustrated step-by-step instructions for hand-drawing basic Atlas CareMaps, recommendations for doing more with maps and using the Atlas CareMap webapp, and suggestions for sharing with relatives and friends. Creating Atlas CareMaps guide — as a handy reminder of the key steps for hand-drawn Atlas CareMaps, you can download this guide. Since an Atlas CareMap is fundamentally a diagram of “Who cares for whom?”, it is important to define what counts as “care”. We provide some suggestions at Types of Care. But in the end,it is your Atlas CareMap, you get to decide what counts. You can draw an Atlas CareMap at www.atlascaremap.org. Note: Based on extensive experience, we strongly suggest you first learn to draw Atlas CareMaps by hand. Once you are comfortable with the concept, then you can use the the webapp to take advantage of its extra functionality. The most important benefits of the webapp are: easy editing; include more details about the people involved and the types of support they provide; view the map in different ways, by choosing characteristics to emphasize; seeing changes over time; and making it easy to print and share. Technology Requirements: A computer or tablet with an up-to-date OS and modern web browser (Chrome, Safari, Firefox and Edge). Some functions may not work properly with older software. 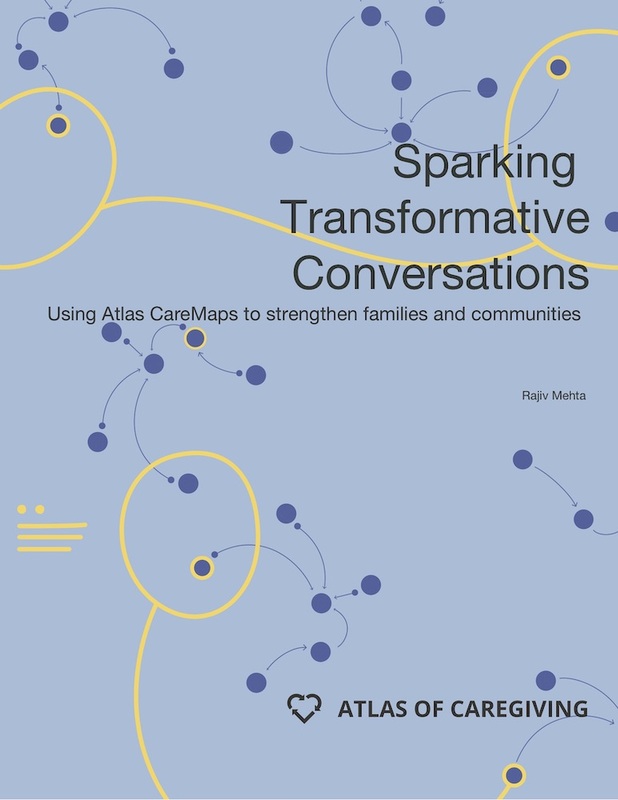 Download our booklet “Sparking Transformative Conversations: Using Atlas CareMaps to strengthen families and communities” to learn how to teach and spread Atlas CareMaps in your community (whether neighbors, employees, patients, etc. ), and to nurture conversations that unleash community wisdom.